The practice of Somatic Yoga develops greater awareness of the specific parts of your body by using small, gentle, slow movements that bring the body back into alignment, release pain and tension. Based on the teachings of Thomas Hanna, Somatic Yoga is a gentle, effective method of balancing the neuromuscular system by re-training the way that the brain communicates with the muscles. By changing the way that our brain senses and moves the muscles, we can break old postural habits and release tight muscles, leading to more fluid, flexible and pain-free movements. In this workshop we will spend time looking at the first three somatic yoga lessons, lesson one, controlling the extensors muscles of the back, lesson 2 controlling the flexors muscles of the front and lesson three, controlling the muscles of the waist. And as a bonus, we will end off with a delicious vegetarian bite to eat where the team will happily answer any additional questions. 9:45 for 10am till 1pm. Investment: R450. R50 discount if booking and paying in full before 8 August 2015. Included: Light snack, lucky draw & notes. Please bring a yoga mat if you have one. If you answer yes to one or more of the below reasons, then you should seriously consider investing in this workshop. Yoga teachers who are interested in the remedial and therapeutic side of yoga. This is a great workshop to do to give you practical tools to help work one on one or in small groups with students who have back problems and need to switch on the functional and supporting muscles of the body. People with back problems. New to yoga, maybe even never done it before? Not a problem. 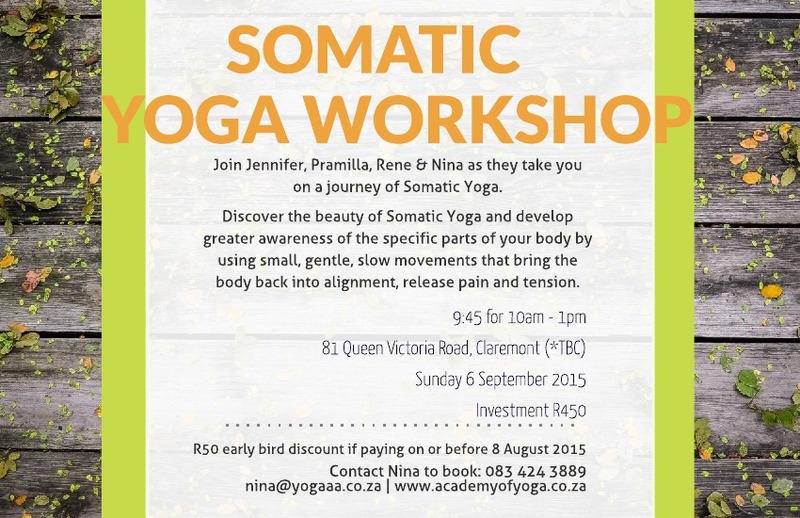 In this workshop we explore the basic somatic exercises that help bring the body back into balance. Even pure beginners will be able to follow easily. Connecting deeply to your body. Are you struggling to hear what your body is telling you? Then join us as we slow things down… a lot, soften and connect deeply to how things are really feeling inside. Those who want to create a simple 10 minute home practice routine that they can do easily while at home or travelling. Learn the basic somatic practices and then combine the main ones to create a routine that can be practiced anywhere anytime. Those who need time out. Need an excuse to get away from the family or get yourself out of a function you’re not keen on attending? Then come and relax on your mat and enjoy the gentle and nurturing class the AYA team have put together for you. Who’s this workshop not for? If this is your reason, then sorry, this workshop is not for you today. Looking forward to assisting you on the mat. ‹ Previous31st May 2015: Celebratory Satsang for the Mothers of Ananda Kutir Ashram. Next ›Honouring of the Mothers of Ananda Kutir Ashram in Rondebosch East, Cape Town.